If you wonder whether anything fresh can be said about pairing wine with food, Hadley and TJ Douglas will make a believer out of you. 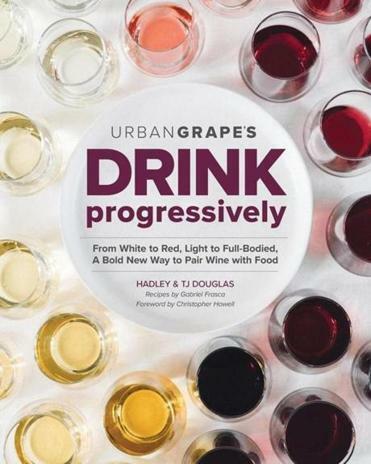 In their new book, “Drink Progressively: From White to Red, Light- to Full-bodied, A Bold New Way to Pair Wine with Food,” the husband-and-wife team at The Urban Grape lay out their innovative approach. The book’s organizing principle mirrors how the couple stocks the shelves of their South End wine shop: from light-bodied to full-bodied, rather than by varietal or region. They liken that progression to skim milk, whole milk, and cream — an analogy that uses weight as the key to successful pairings. For example, a winsome txakoli finds its match in a salad with melon and jamon, while an oaked chardonnay cozies up to a comfortingly rich mac & cheese. Reds are similarly arrayed on their own scale. Turn the page for recipes, developed by Gabriel Frasca, executive chef at Nantucket’s Straight Wharf, then peruse the sidebars to learn how vineyard conditions and winemaker decisions yield pours that are just your speed. The 240-page work reflects the smarts and joie de vivre of the duo. “We’re trying to give everyone a language to understand why they like what they like, and ask for what they want,” Hadley enthuses. Drink Progressively ($27, Spring House Press) is available at the shop, 303 Columbus Ave., Boston, and at www.theurbangrape.com.